Once heard, Orions Belte is hard to forget. Mint is a retro sounding instrumental feast for the ears. It's easy to spot some of the band's influences and a lot of the tracks will sound very familiar... as though from a long forgotten dream. From the guitar licks in 'Joe Frazier' to the drum beats in 'Le Mans' you'll feel like you've heard this before... but where? The band is formed of Øyvind Blomstrøm (guitar, pedal steel), Chris Holm (bass, vocals, keyboards) and Kim Åge Furuhaug (drums, programming). Mint contains 9 tracks (35 min, 28 sec), which beautifully drawn on the psychedelic as well as the electronic and indie genre. 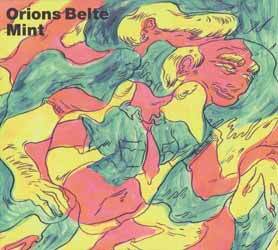 Spend a little time in Orions Belte's world - you won't regret it.